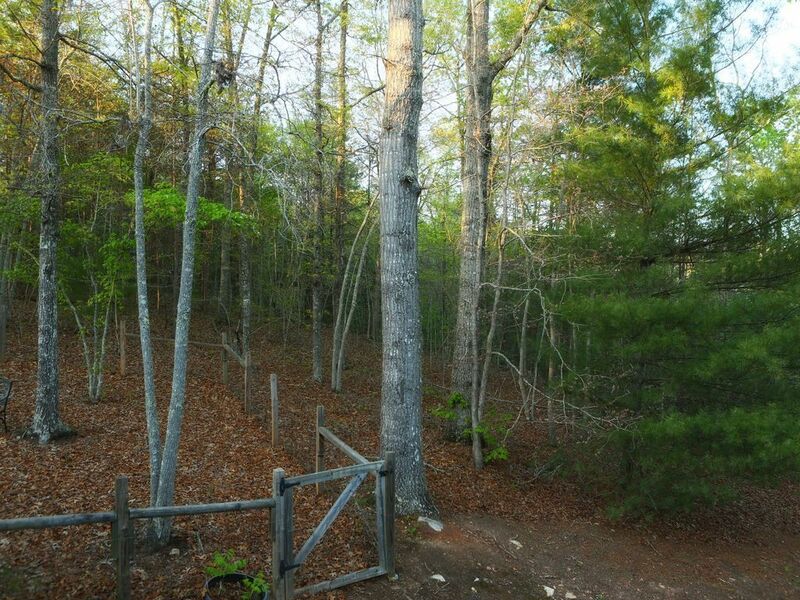 2BR Warne Cabin, Privacy & Hot Tub on Covered Porch! 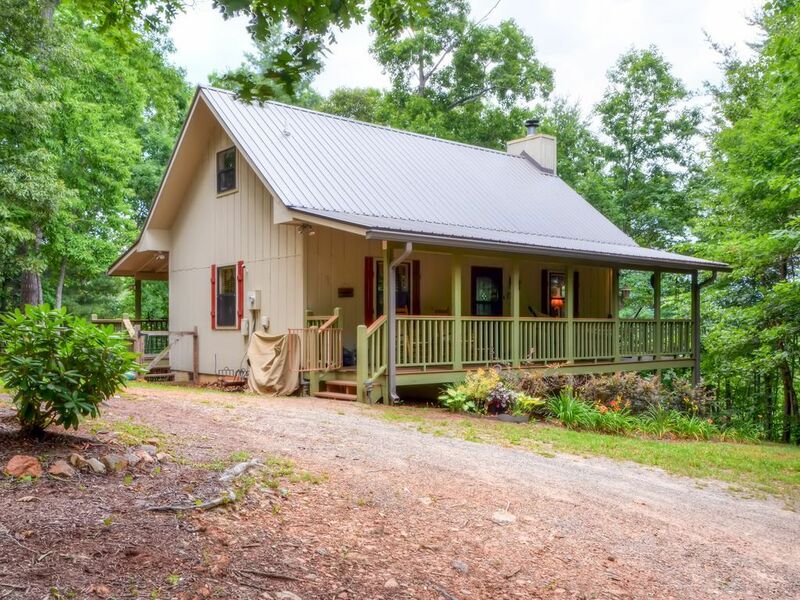 If you're looking for a serene mountain getaway, you won't find a better home base than this phenomenal Warne vacation rental cabin! 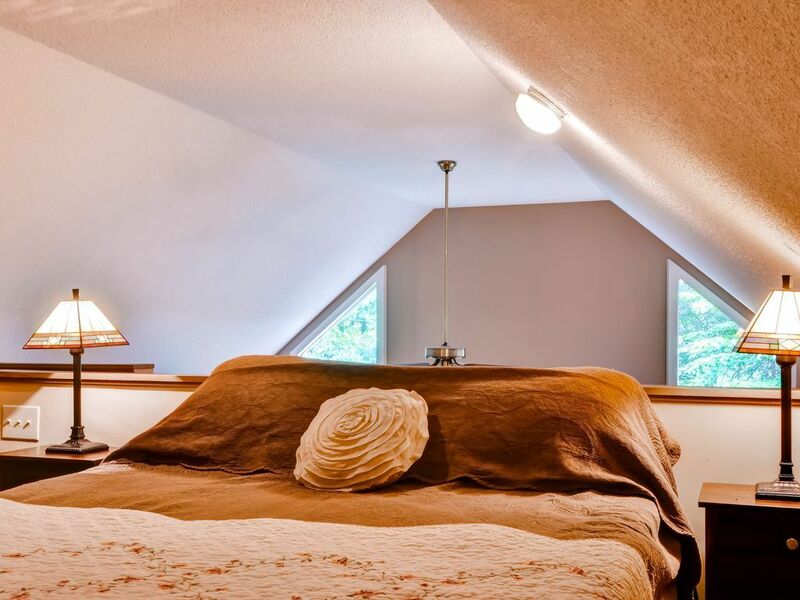 Boasting 2-bedrooms (1 in the loft), 1.5-baths, and accommodations for 5, this unit promises an unforgettable retreat for friends or families! On the drive in, you'll be surrounded by natural alpine splendor. 'Lorelai's Lair' sits on 3 acres of land at the end of the lane, and offers an immense sense of privacy amongst the magnificent towering oaks and lush North Carolina vegetation. 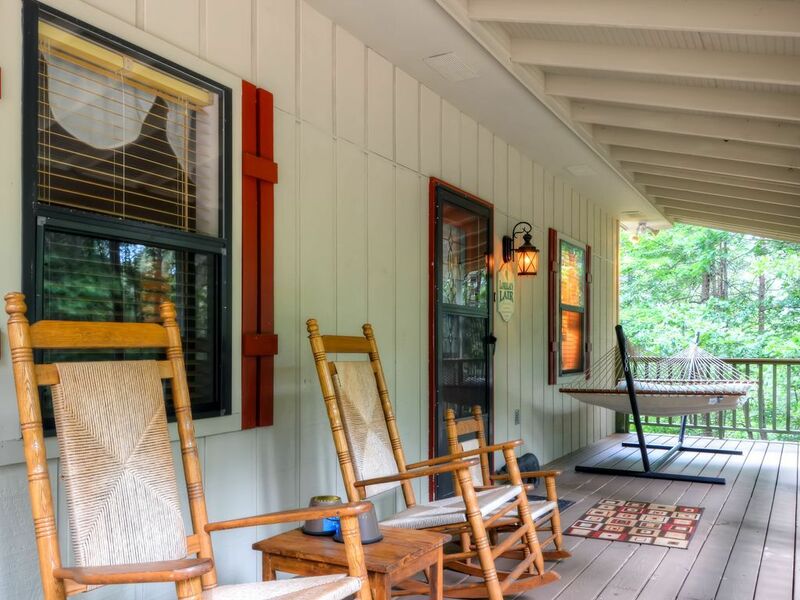 Upon arrival, you will be greeted by the welcoming front porch, the ideal place to unwind offering quaint wooden rocking chairs and a breezy hammock. 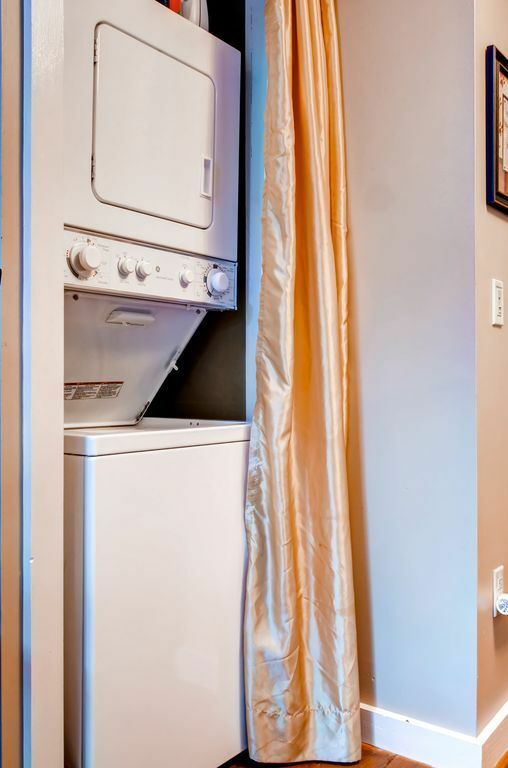 To further your level of relaxation, the interior of the cabin features all the comforts of your own home and more, including air conditioning, wireless internet access, wood-burning fireplace and in-unit laundry machines. 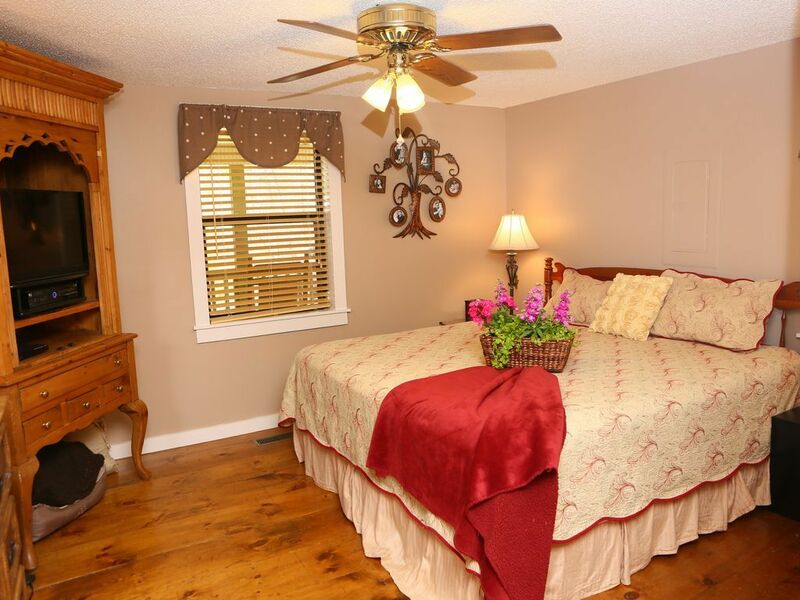 Everyone will have plenty of room to spread out and relax among the unit's 900 square feet of tastefully appointed living space, making this the ideal lodging choice for a family or small group of friends seeking a tranquil escape to the North Carolina Smoky Mountains. 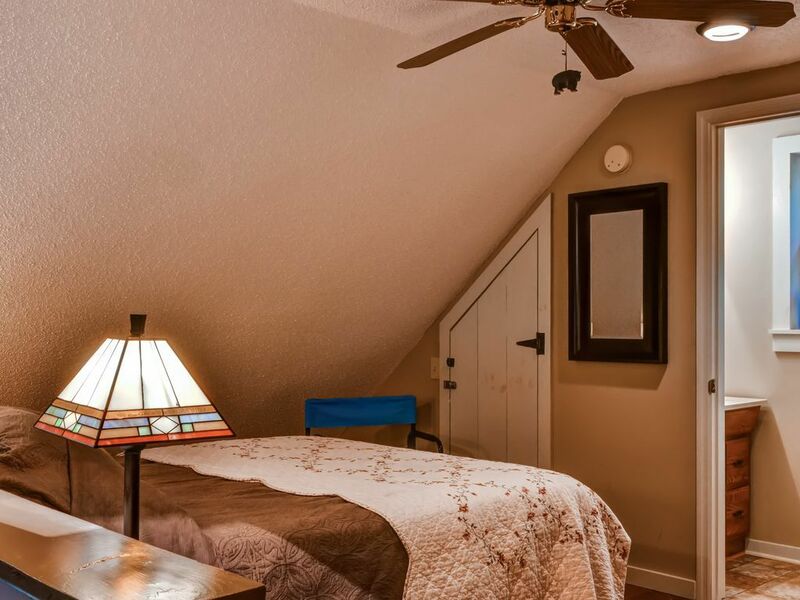 Wake early to the sounds of roosters crowing outside of your window, as the sweet mountain breeze blows through the cabin invigorating your senses. 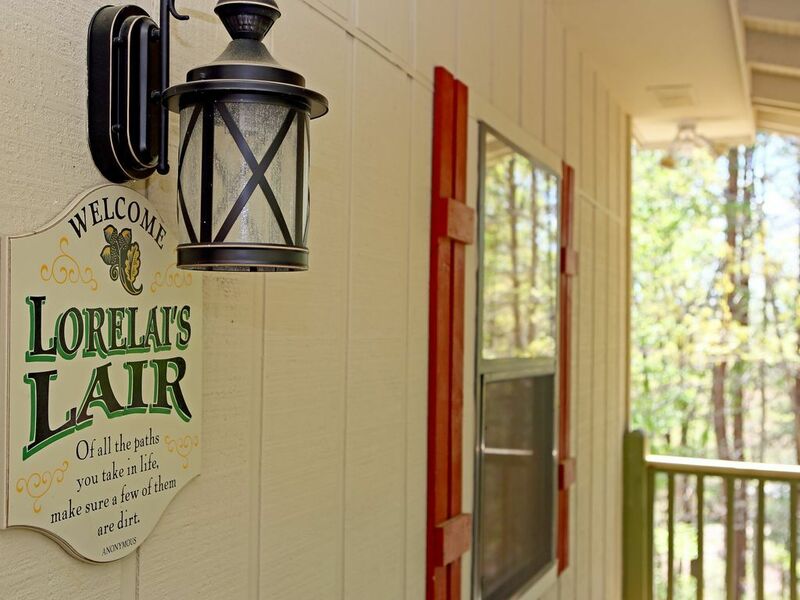 You'll look forward to sipping your morning coffee in one of the wooden rocking chairs as you watch the warm sunrise above the treeline - if you're lucky, you might even catch a glimpse of the deer or rabbits munching on the roses! Keep your eyes peeled for the abounding wildlife surrounding the property, as wild turkeys, whip-poor-whills, and woodpeckers are known to frequent the area. 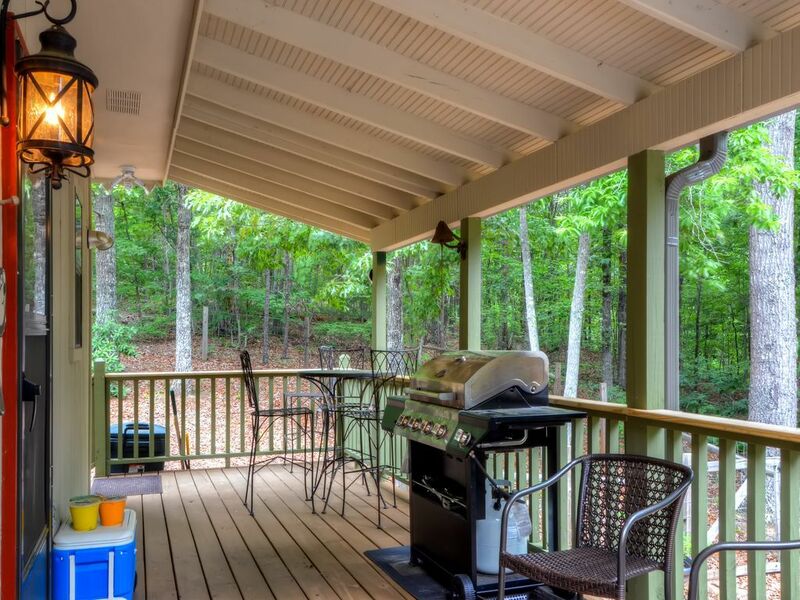 Savor a delectable meal at the charming dining table or take it outdoors and dine al fresco in the crisp mountain air on the back porch. If the weather is nice, head outside for dessert, where you can roast marshmallows by the flickering light of the outdoor firepit. 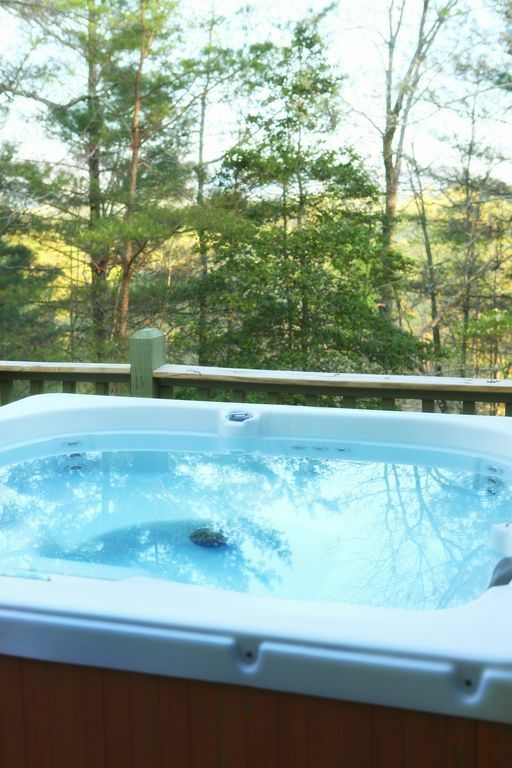 Soothe your troubles with a soak in the private 4-person hot tub, as you share a decadent glass of wine with friends beneath the marvelous night sky. 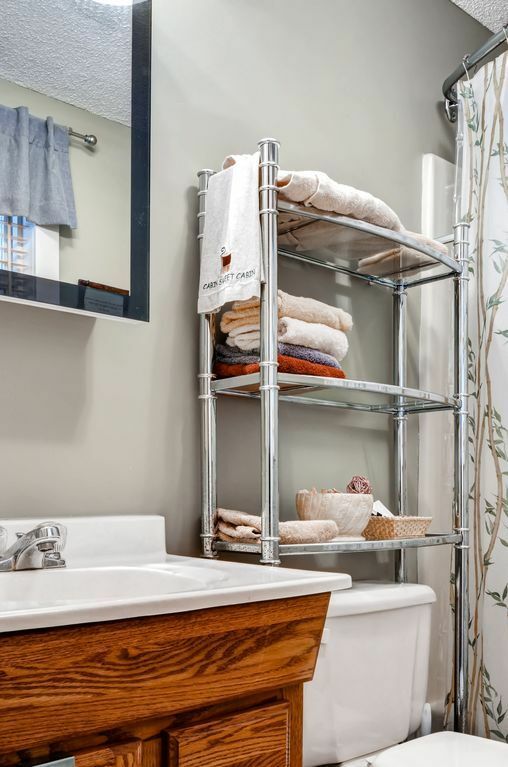 Although 'Lorelai's Lair' offers all the comforts and conveniences that you could ask for in a home, perhaps the best feature is what lies around it. Several popular events are hosted in the three towns near the property, including the Georgia Mountain Moonshine Cruiz-In, Georgia Mountain Fair, and various concerts at the Georgia Mountain Fair. Soak up some of the sweet southern charm found in the neighboring towns, as you explore the quaint streets lined with hometown boutiques, classic cinemas, and enchanting antique shops. Discount coupons to Crane Creek Winery are provided with each booking, where wine enthusiasts can enjoy tastings, gift shops and special events year-round! Of all the adventurous paths you may take during your stay here, be sure to let some of them be dirt! 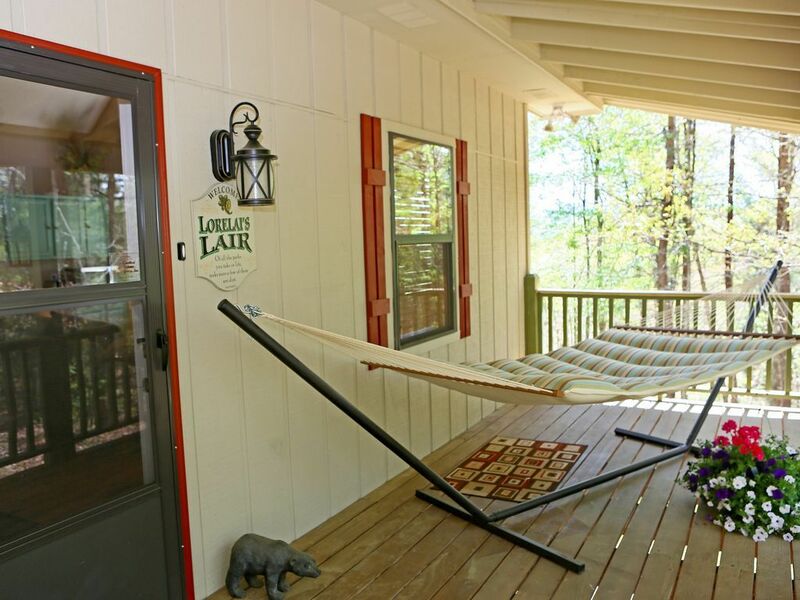 'Lorelai's Lair' is mere minutes from Chattahoochee National Forest, where you can hike the nature trails, gallop through the trees on horseback and explore the stunning waterfalls. If you'd like to experience the area by water, head to any of Lake Chatuge Recreation Area's multiple boat rental locations, and spend your day splashing around in the sparkling blue waters. 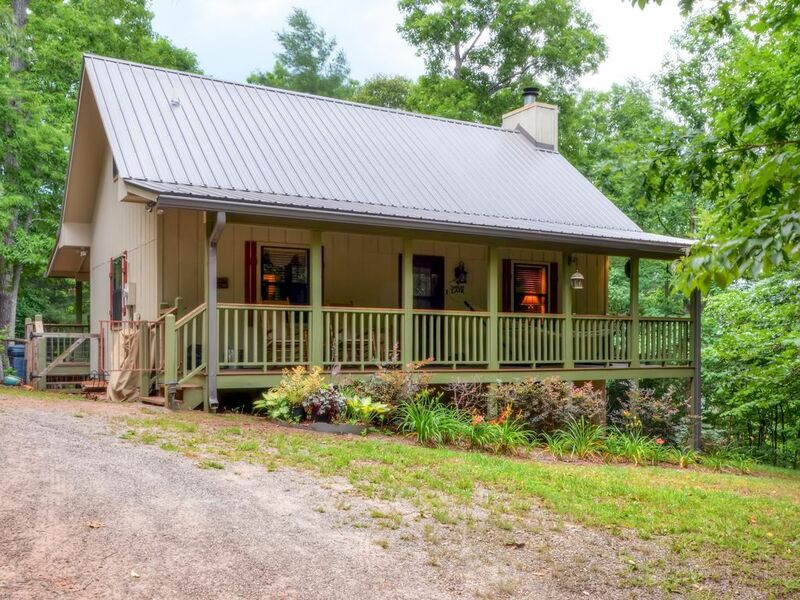 Regardless of how you plan to spend your time during your stay in this gorgeous destination, this incredible Warne vacation rental cabin ensures a serene, nature-filled getaway you won't forget anytime soon! This property is also our vacation home. There are some personal items in the home so if this is a problem for you, please rent from someone else! 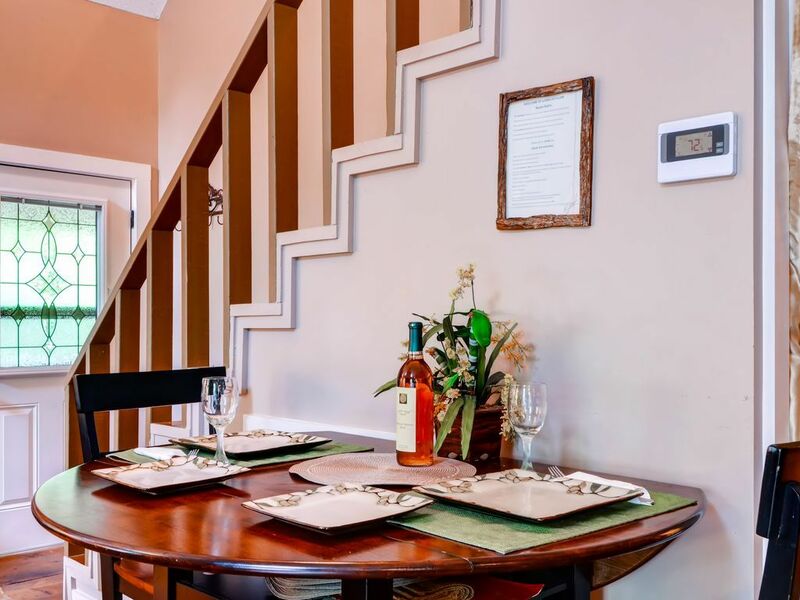 - Amenities include a fully equipped kitchen, air conditioning, wireless internet access, private hot tub, 2 covered porches, in-unit laundry machines, flat-screen cable TVs, Wii game console, computer games, fire pit, gas grill, fireplace and much more. 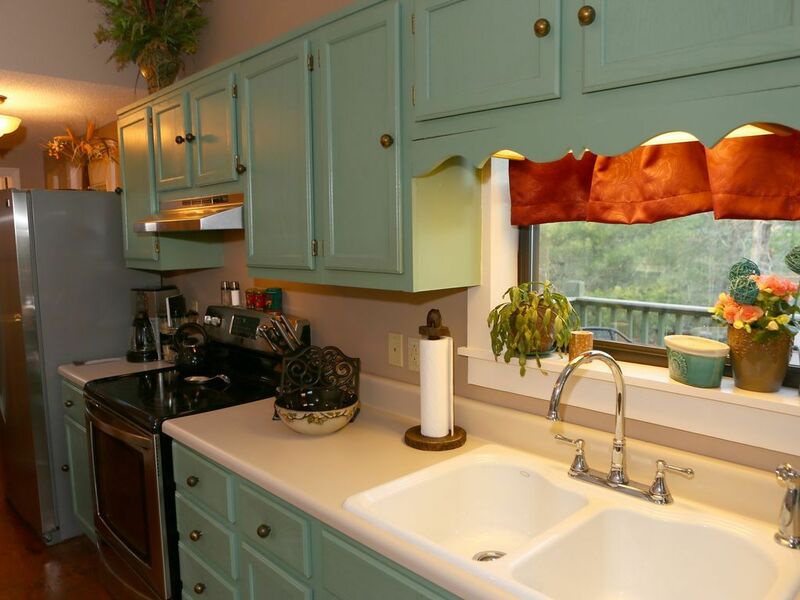 - Unbeatable North Carolina location near North Georgia border - Close to John C. Campbell Folk School, Chatuge Lake, Young Harris College, Hiwassee River and Brasstown Bald - home of the Possum Drop. Very reasonable cancellation policy, please call owner for more information. 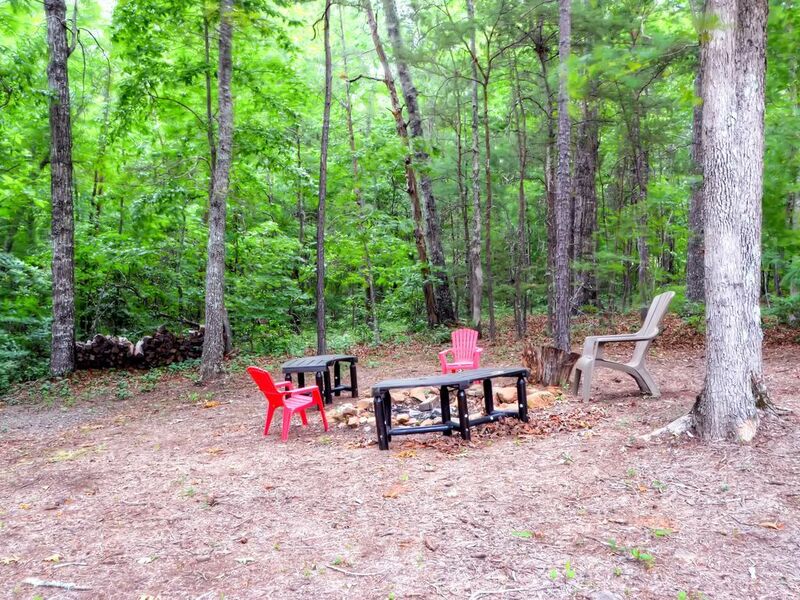 Great experience, loved this secluded cabin and all of the welcoming amenities it provided. Will be back! 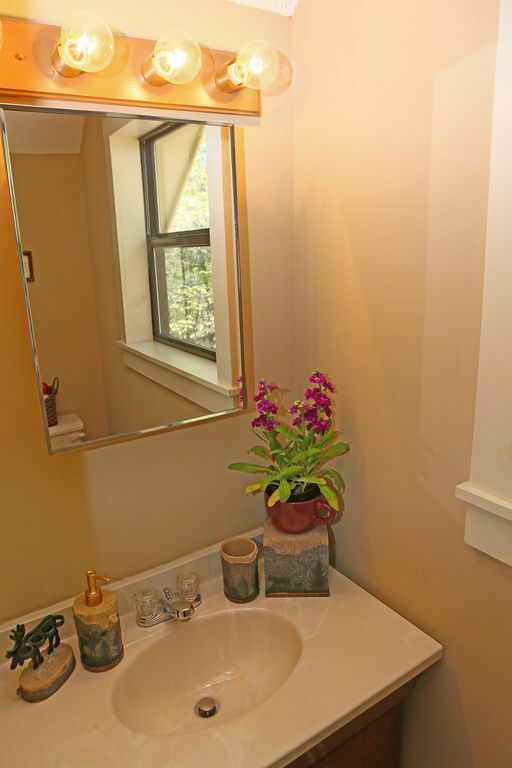 Beautiful property, very well appointed, clean and family and dogs ready. Thank you!!! This cabin was very well stocked with all the Comforts of home. My husband, my dog and I rented this cabin for 5 days. We absolutely loved our stay and really enjoyed the fenced-in yard. We will definitely be back for a second visit. 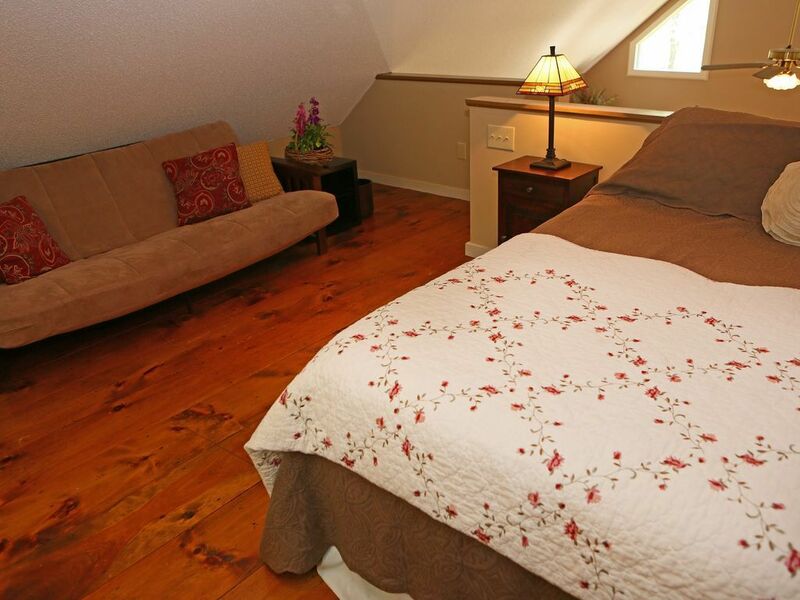 The cabin is in an excellent location to get away and relax. Adventure and fun are all within driving distance. Be sure to pick some fresh blackberries on the driveway coming up the cabin and be on the lookout for deer and bunnies! 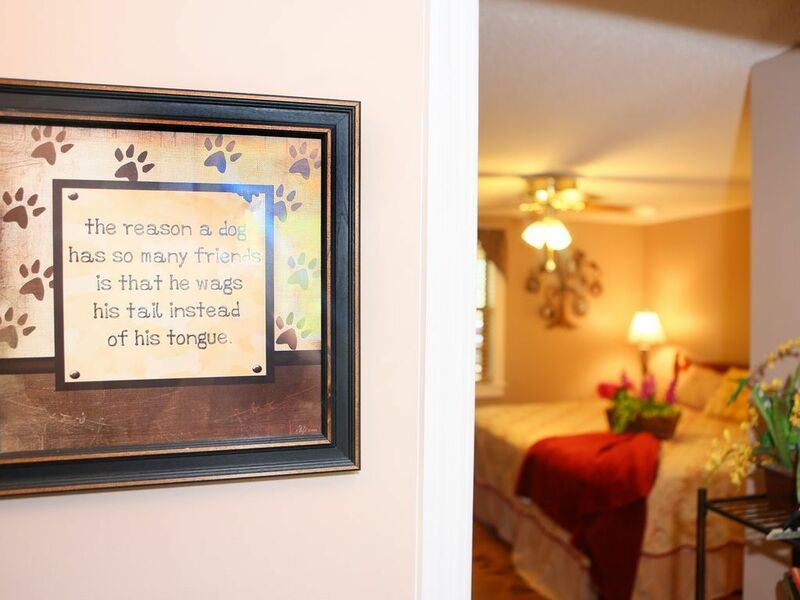 Beautiful space, great for pets! Our hosts have a beautifully appointed home. We spent Christmas here and they even provided a decorated and lit Christmas tree. We left only to hike and grocery shop. We enjoyed the fire, the view, and the fenced yard! Great for our small dogs. So quiet! We will be back! Cozy cabin, tucked away in the woods! We used the cabin for a romantic getaway. The front porch and hammock were the inviting appetizer to a well appointed and cozy interior. 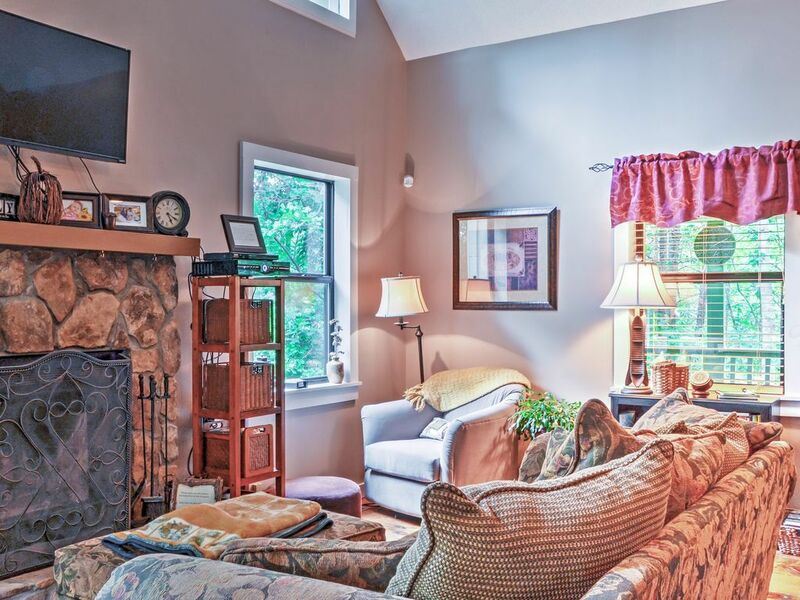 The kitchen was fully stocked, the couch in front of the fire was comfortable. 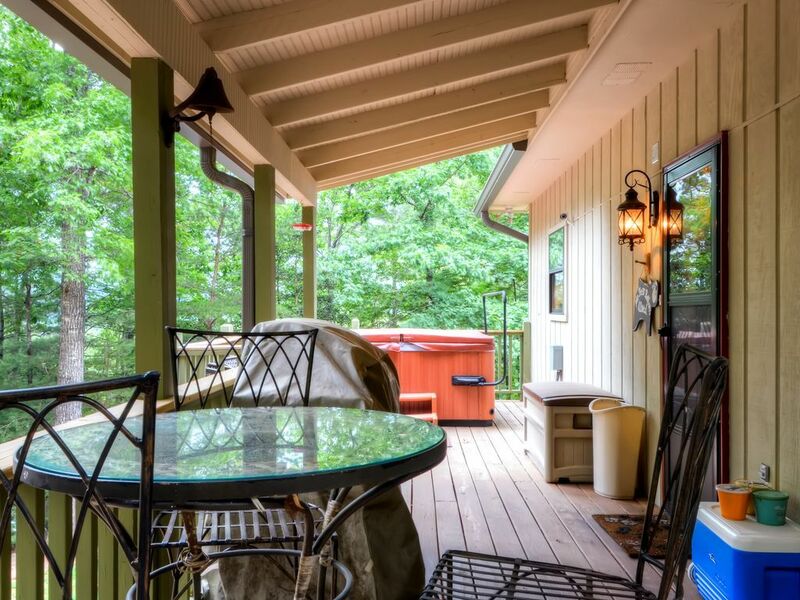 The back deck included a large gas grill and a hot tub. We especially enjoyed stargazing from the tub late at night. 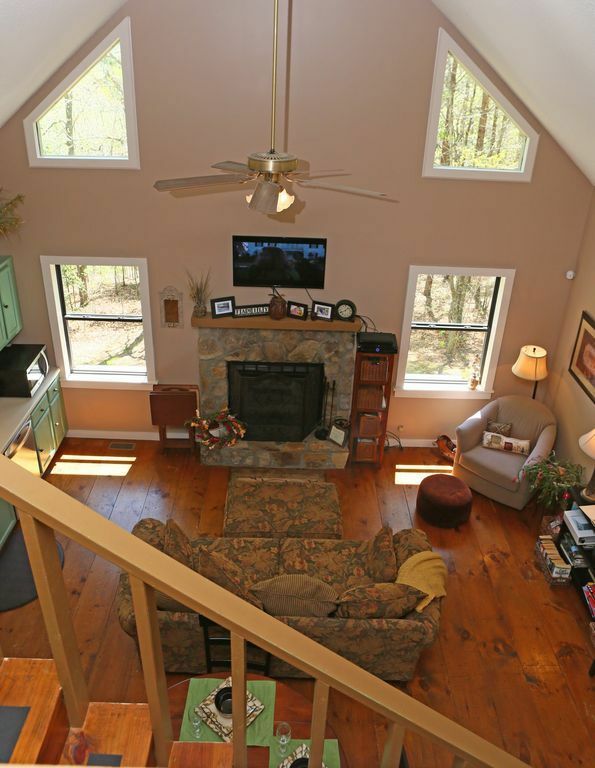 The cabin is easy to get to and for us it was a great base for day trips to Franklin and Murphy and Dry falls. The cabin had all the amenities of home. 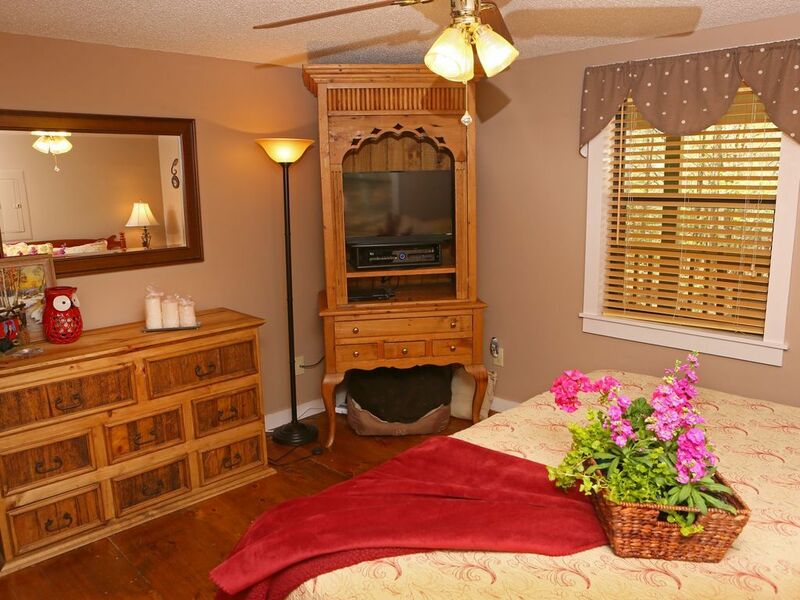 Comfortable king bed downstairs. Grilled out on the back porch then took a soak in the hot tub, even had a camp fire and roasted marshmallows for s'mores!! Thanks for the hot chocolate for the kids. All the small things make such a big difference. That's what make Lorelais cabin so great! Found the cabin exactly as described: for example, the kitchen was actually well provisioned with real / sharp knives, etc. (even a crock pot). It was just right for us. We really enjoyed our stay at your cabin. Perfect for vacationing with a dog. Loved the fenced in area for our dog. Beautiful inside and out. Modern kitchen appliances but still had that cabin feel to it. Thanks for sharing your place with us. We would love to come back and stay longer! This place was perfect for our small family. We even got to bring along our 4 legged children! We spent our Christmas there and the owners had it feeling like Christmas there. Everything we possibly needed was available to us! It was close to the gas station and Ingles and Walmart were not far. The loft was perfect for our son to stay. Absolutely the cutest little lair, and the owners made it feel so cozy. We felt at home. We would love to come back!! We loved it & cant wait to come back. P.s. We left a few things and the owners contacted us and arranged to have them shipped back home. That meant a lot for them to take the time out to do that! My family and I really enjoyed staying at this wonderful cabin. It was very clean and inviting. The location was great and private. Nice mountain views. The hot tub was nice during the chilly nights. Perfect location, perfect cabin, and perfect view. My husband and I visit the Blairsville area often, but usually stay in Georgia. This cabin sits on the GA/NC line and we did our fall tour mostly in NC. The John Campbell Folk School is not far and our visit there made us want to signup for classes in the future. The fall leaves are truely spectacular so we went on a waterfall hunt making the trip from Hayesville,Franklin,Highland,Cashiers, Sapphire and finally to the highest waterfall east of the Rockies- Whitewater Falls. Next we antiqued- Clayton and Hiawasse and Hayesville. Each day we were greeted by the wonderful hot tub. We even saw a deer slinking by while we were in the tub! The weather was a little warm for the fireplace, but we did have A fire in the pit one night. Grocery stores are convent as Hayesville, Hiawasse, and Blairsville are not far and all have a wonderful Ingles. The owners are pleasant and helpful. We would definitely rent here again! Love, love this cabin. Had a couple of little hiccups but was wonderful staying here. 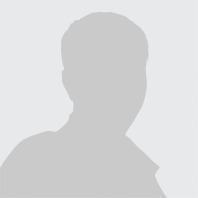 Lisa Burch 803-924-8653 Show Phone No.